The webbing is a rust/burgundy woven nylon and the ribbon is an array of mauve, lemon, lime, aqua, pink and orange daisies. E-Z Snap patented handcrafted leashes feature an expandable handle with a side release buckle to safely secure your pet. The leashes feature a nickel plated snap and a durable side release buckle. All of the handcrafted leashes are 3/4" in width and are 6 feet in length. Price quoted is for 1 leash. Matching collar available. The webbing is a bright blue and the ribbon is a mix of green, yellow, red and blue stars on a white background. Price quoted is for 1 leash. Limited quantity available. Matching collar available. A rainbow of diagonal stripes of aqua, purple, red, orange, yellow and green on a webbing which varies from purple to burgundy/rust to green. I have no control over this variation in webbing colours. Whichever webbing colour, there is a matching collar available. Our East Side Collection™ Rhinestone Cat Leads are the fashionable way for cats and their owners to hit the town! Made of durable nylon, they feature a sparkling row of rhinestones for a glamorous look. Built-to-last Leads include a nickel swivel clip for easy attachment to harnesses and secure stitching. Lead measures 3/8"W x 4’L.Matching collar is available. Our East Side Collection™ Rhinestone Cat Leads are the fashionable way for cats and their owners to hit the town! Made of durable nylon, they feature a sparkling row of rhinestones for a glamorous look. Built-to-last Leads include a nickel swivel clip for easy attachment to harnesses and secure stitching. Lead measures 3/8"W x 4’L. 7. 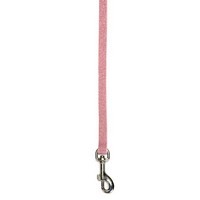 Adjustable Cat and Puppy Leash 3/8"
Prestige Cat and Puppy Leash is available in Hot Pink, Royal Blue and Turquoise. Each leash is 3/8" in width and 122cm in length. The Avenue Retractable lead by Hagen features a stop and lock control. Push button instantly engages the brake. Single thumb acton locks leash into position. Protective snap cover protects you from metal snap should the leash recoil unexpectedly due to collar release. Wide grip ergonomic design diminishes hand fatigue and provides better control. Accommodates hands of all sizes. Length of lead is approximately 10 ft/3m. Suitable for cats up to 9kg. Price quoted is for 1 Avenue Retractable Lead. The Catit Nylon Cat Lead is 0.5cm wide and 1.2m in length. 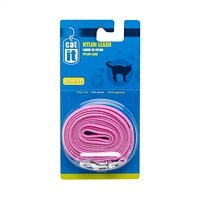 Price quoted is for 1 Catit Nylon Cat Lead. Add some shimmer and shine to any cat's look with our East Side Collection™ Puttin' on the Glitz Leads.